Housing activity is on the upswing after a slow start to the year. Showings, new listings and pending sales are increasing across much of the country, and inventory is straining to keep pace with demand. These pivotal weeks of the spring market are worth watching with extra care, as they may portend the entirety of the 2019 residential real estate market. Buyers are certainly active. Sales and prices will be strong if there are enough options to choose from. If February was the month of record snowfall, March was the month of record wet basements. The effects of extreme weather continue to impact the market. Despite that, the latest numbers for Twin Cities residential real estate show some strength amidst ongoing signs of change. Prices continued to climb, reaching a new record. New listings fell 8.8 percent as fewer sellers listed their properties. Closed sales were down 9.3 percent as some buyers waited on soggy properties as well as additional inventory options. Market times rose year-over-year for the first time since March 2015. Another sign of a changing market is the ratio of sold to list price has fallen for four of the last five months. This—along with other indicators—suggest the market is improving for buyers, even though sellers still have strong pricing power, favorable negotiating leverage and quick market times. The number of active listings for sale decreased compared to the prior year. Even so, buyers have seen inventory gains for five of the last six months. Months supply, however, was flat at 1.8 months, suggesting the market is still tight but realigning. Buyers should still expect competition on the most coveted listings. After touching 5.0 percent in November, mortgage rates have settled back down around 4.1 percent, which is great news for buyers. The supply squeeze is most evident at the entry-level prices, where multiple offers and homes selling for over list price are commonplace. The move-up and upper-bracket segments are less competitive and better supplied. All information is according to the Minneapolis Area REALTORS® based on data from NorthstarMLS. Minneapolis Area REALTORS® is the leading regional advocate and provider of information services and research on the real estate industry for brokers, real estate professionals and the public. We serve the Twin Cities 16-county metro area and western Wisconsin. 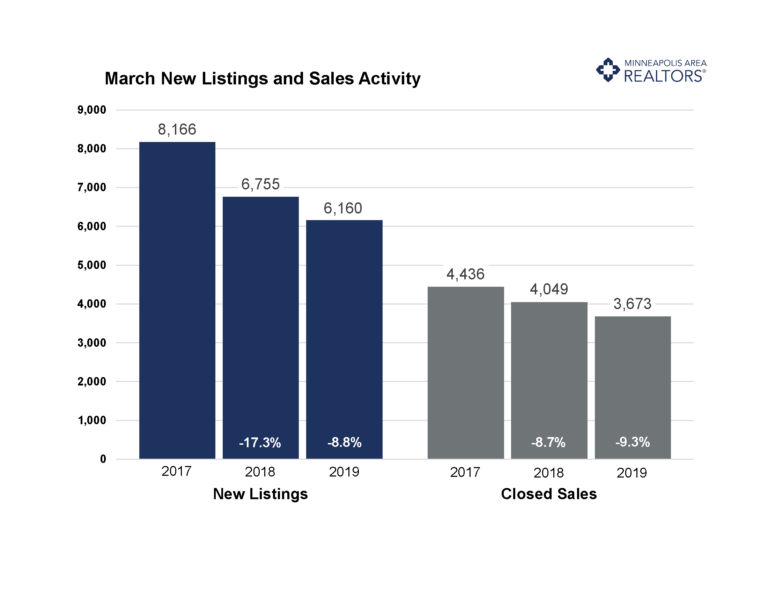 New listings finally started to perk up across the nation last week, effectively launching residential real estate into the springtime selling season. Much has been said and written about the slow launch of new homes for sale in what was anticipated to be a year of rising inventory. Mother Nature has had different plans so far in several markets, adding another burst of winter weather in April that may spoil an otherwise promising start to the second quarter of 2019. The national unemployment rate held firm at 3.8 percent for the second month in a row, which is good news for an economy that has shown signs of slowing down during the first three months of 2019. Hiring and wage gains have both been below expectations, retail sales dropped considerably to close 2018, and there have been fewer home sales across the nation. Maintaining a historically low unemployment rate is reassuring and may offer confidence to many wary and weary consumers.